Today the Torygraph reports that MPs have announced that over-optimistic forecasts for passenger demand have left taxpayers “saddled with £4.8 billion of debt” over the 68-mile HS1 London-Folkestone Channel Tunnel rail link. Total taxpayer support over the period to 2070 is likely to be £10.2 billion. Apparently, international passenger numbers on HS1 are only a third of the original 1995 forecast and two-thirds of the ‘corrected’ Department for Transport forecast in 1998. “Oh aye, bluidy typical!” comes the standard Scots gripe. “Thae English tak’ wur siller tae pay fur mair whigmaleeries doon in Lunnon”. 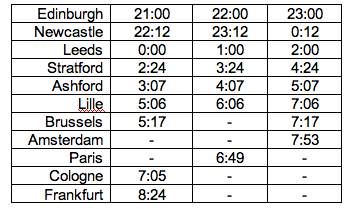 The original plan for Regional Eurostar services to destinations north of London was abandoned after connecting services from places like Edinburgh saw little traffic. But the problem with those services is that they took much longer then bog-standard GNER trains at the time. Now significantly improved journey times are available with HS1. It is physically linked into both the East and West Coast Main Lines (ECML & WCML) through Stratford International and the North London Line to Willesden, Watford and points north. 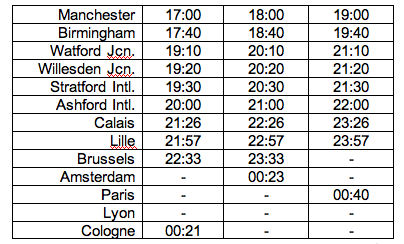 By Eurostar’s own estimates, following the December 2009 opening of the Benelux HSL Zuid, a London–Amsterdam journey is estimated to take 4¼ hrs. 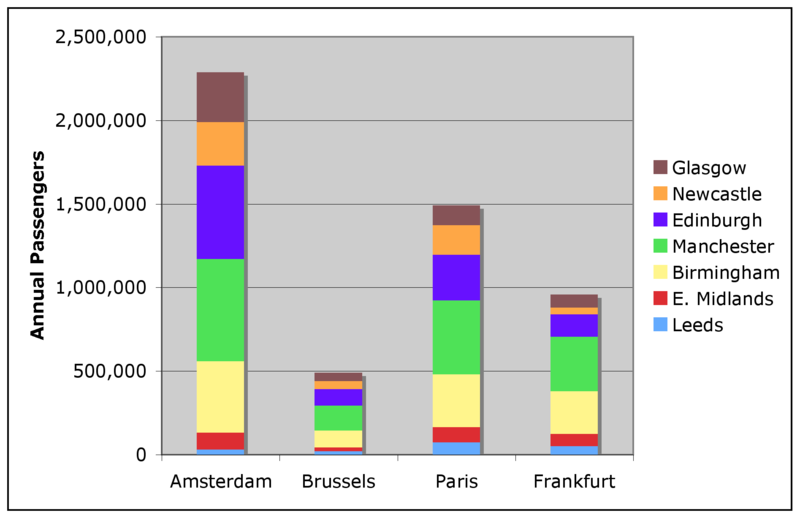 In 2010, international rail travel was liberalised by new European Union directives, designed to break up monopolies in order to encourage competition for services between countries. Germany’s Deutsche Bahn, now intends to run services between London and Germany and the Netherlands. The sale of HS1 by the UK Government (having effectively nationalised the original ‘London & Continental Railway’ in June 2009) is also likely to stimulate competition on the line. But all these new ideas refer to London-to-Continent traffic. The ‘regions’ remain ignored—partly due to English xenophobia about foreigners (all Chunnel trains run as if they ran only on UK soil) but mostly due to London-centric thinking that is the bane of the rest of us. In a 21st century of international trade, Schengen agreements and foreign travel by everyone and their granny, isn’t it time that the massive public investment of £21bn that is the Chunnel and HS1 were utilised by the 80% of the UK that isn’t London to recoup their £16bn subsidy of the capital? Oh, really? There is no real need to wait for any HS2 for this ‘other 80%’ to start exploiting fast rail to Europe. Booming Continental air traffic from everywhere North of London is a clear sign of the demand. An overview is shown in Chart 1. Some 5 1/4 m people fly between the areas in question. Even assuming only 50% of those as the potential market, 20 trains a day, each carrying 360 passengers could not transport them all. This represents a considerable untapped market that neither Eurostar or the UK Government seem keen to exploit, quite apart from the ‘green’ element of not piling even more people into fuel-inefficient short-haul jets. If such services ran at Eurostar/ICE/InterCity225 speeds, all of the above could be encompassed through using the currently unused 33% capacity of HS1/Chunnel. 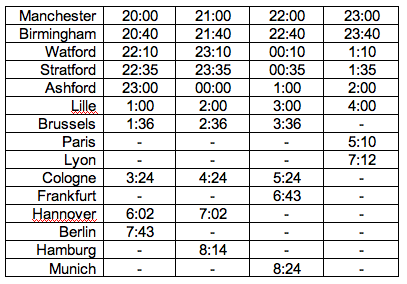 Draft timetables are shown below. Now that Network Rail has adjusted much of the British network to accommodate European dimension trains, the main problem would be differences in power standards for overhead lines in some countries. The concept of a fast service that could shift over 2m passengers onto rail each year is surely a driving incentive for future travel. In a third of the cases, no direct flights are available, which puts fast rail at a speed advantage too. For the rest, standard return fares of around £200 from the Midlands and £250 from Scotland/North would make them competitive with the air alternative, while the option for luxurious facilities that would justify a true 1st Class service at less than the £750 typically charged by major air carriers. Assuming an eight carriage sleeper train (two of which are 1st class) gives a potential revenue of some £40,000 in revenue per train. Extrapolating a year’s revenue for the ten trains described above at average 50% loading gives a rough turnover of £45m each year, even allowing one night per week (Saturday) with no trains for track maintenance. Given Eurostar’s revenues of around £675m, an enhancement of 7% in payments for use of HS1/Chunnel would change its finances and point the way for a far easier integration of UK business outside of London with its Continental partners. And all that would be based on switching only 25% of those using airlines to travel from the Midlands/Scotland. Once a UK government realises the short-sightedness of zero VAT and duty on aviation fuel, the gamble on air traffic as sole mainstay of UK Continental interactions outside of London will become even more obvious. Once ‘regional’ service is proved with the above, the folly of assuming everyone changes in London will be exposed and interchange points like Willesden and Stratford (as connected as St Pancras but much less crowded) will become popular with Londoners too. This entry was posted in Commerce, Transport and tagged Chunnel; Eurostar; sleepers. Bookmark the permalink.